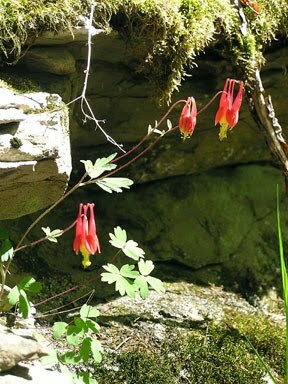 Columbines (Aquilegia canadensis) nodding in Spring sunshine, a sure sign that morels are afoot -- or possibly underfoot. "It's May, it's May," and (if Alan Jay Lerner and Frederick Loewe are to be believed) it's that wonderful time when "when ev'ryone goes blissfully astray." We suspect they had other distractions in mind, but we'll take our rapture from early spring greens, morels, fresh trout, tiny radishes and sweet early peas. Regular subscribers to our updates newsletter receive these updates from our blog, Just Served, directly -- but there is much more at the blog that isn’t sent automatically. We understand that many (OK, most) folks have better things to do with their time than wade through countless unwanted e-missives, so we won't add ours to that pile. However... should you feel an inexplicable craving for exactly the sort of self-indulgent claptrap we periodically post, you can satisfy that urge at Just Served. Last month we posted "Creamsicles, Re-Imagined," our speculations about the intersection of nostalgia and jaded palates. There were a few other posts -- but since they were not about food we won't list them here. However, should you require a dose of non-culinary foolishness, check out the Archive for April. Leitesculinaria is still in the process of reposting, sometimes -- with shiny new updates and edits -- some of our older articles. The entire list of our currently-posted LeitesCulinaria articles is available here, along with several other articles on food history & science. For hard-core addicts of our stuff (assuming such unlikely beings exist), Marty Martindale's Food Site of the Day has been completely redesigned, and has returned to posting A Quiet Little Table in the Corner -- an index of our writings on the web. Here's a selection soon to be added to On the Table's culinary quote pages. "The Resource Guide for Food Writers, Update #127" is protected by copyright, and is provided at no cost, for your personal use only. It may not be copied or retransmitted unless this notice remains affixed. Any other form of republication -- unless with the author's prior written permission -- is strictly prohibited.